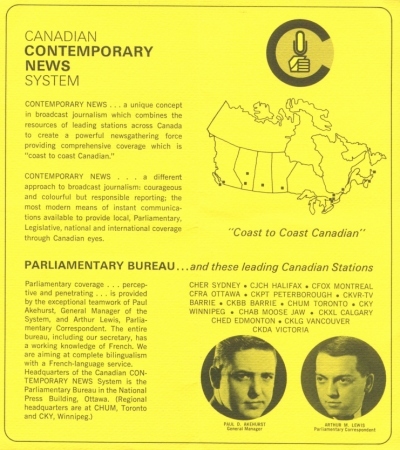 Paul Akehurst was General Manager and Parliamentary Bureau Chief of Canadian Contemporary News System from its founding in 1966 until 1975. Besides Paul and Art Lewis, there were several other notable personalities who served in the Bureau. Senator Mike Duffy, got his start in TV as the first Contemporary News television correspondent from Parliament Hill, from 1972 to 1975. He had been CFRA's Ottawa City Hall reporter in 1971, having just joined them from CHNS Halifax. Mike joined CCNS in 1972 to establish the new national television service. He was also a radio correspondent for CCNS.when he left in 1975 to join CBC radio. He became a parliamentary reporter for CBC-TV's The National in 1977. George Ferguson left CHUM Toronto for the Contemporary News Parliament Hill bureau in 1968. The late Jack Derouin became general sales manager of CFRA Ottawa in 1975 after several years on Parliament Hill for CCNS. Hal Anthony left CHUM to succeed Paul Akehurst as Parliamentary Bureau Chief in 1975, then became News Director of CFRA Ottawa and a hotline host until his death in 2009. Helen Waldron covered music, concerts and the arts from the CCNS Ottawa Bureau from 1970 to 1972 then moved to London Broadcasting to help Bill Hutton (formerly of CFRB) set up a news network in England patterned after CCNS. Marlene Shepherd of CCNS was one of the first female radio reporters on Parliament Hill in 1973. A former Miss Ottawa Rough Rider, in the mid-70's she left news reporting to establish what is now a highly successful Ottawa retail chain selling women's fashion accessories.